Image 4 > Blog > Corporate & Institutional > Americans have a nature problem. Is ‘biophilic design’ the solution? 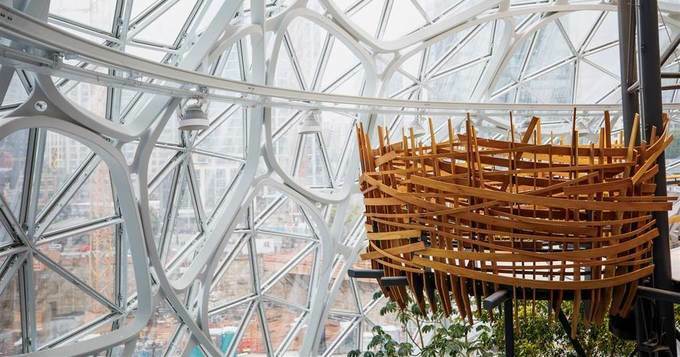 Tech companies including Microsoft, Amazon, Facebook, and Google are using biophilic design to encourage wellness and productivity in their employees. Parks, orchards, greenhouses and ponds...doesn't every workplace have these? That's the goal of an emerging architectural movement called the Biophilic Design Initiative. Piped in breezes, green spaces and soothing water sounds can greatly improve motivation and even help to lower stress and blood pressure.